Hey there! I’m Stephen Brackett, here to talk about the Colorado Early Learning and Development Guidelines. If you have a young child in your life, you probably spend at least a little time each day wondering if you’re doing everything you can to help that child get off to a great start in life. The State of Colorado has created a fun and informational online video series based on the Early Learning and Development Guidelines .These guidelines are sort of a map, helping parents and caregivers navigate their child’s early years. Broken down by age and major milestones, these videos and guidelines are a great way for you to learn more about your child’s world. Curious about how your little one is thinking at this age? Wondering what you can do to help them thrive and reach their developmental milestones? 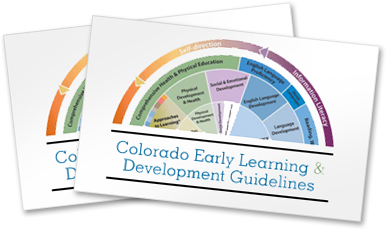 At the Colorado Early Learning and Development Guidelines website, you can download the guidelines, find links to additional resources and support services in your community, and watch more of our videos. So, come on! Visit the Colorado Early Learning and Development Guidelines website at www.earlylearningco.org, for more information and to find out how you can help Colorado’s children get off to a great start! The early years of a child’s life — from birth to age eight — are critically important for learning and development. The Colorado Early Learning and Development Guidelines provide practical tips and points of reference that anyone can use to help kids grow. Whether we’re experts, early childhood teachers, first-time parents, or involved friends and neighbors, we all play a role in giving kids a strong, healthy start.